Quick note to say there are two forthcoming public talks that might be of interest to residents of Vancouver or Victoria. The Vancouver one is by Dr. Ken Ames, Professor Emeritus at Portland State University, speaking at UBC on Thursday October 18th at 11.30. The Victoria one is by yours truly, speaking to the Archaeological Society of BC on Tuesday October 16th at 7.30. Details are below. 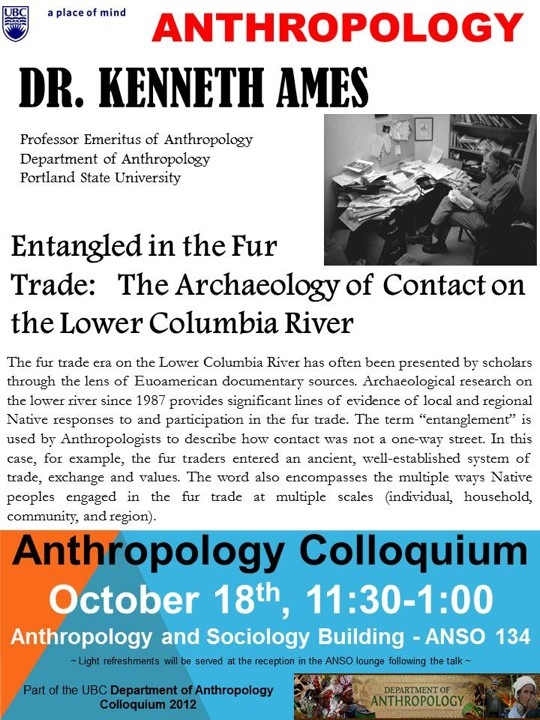 Dr. Ames, the unofficial Dean of NW Coast Archaeology, will be speaking to the topic “Entangled in the Fur Trade: The Archaeology of Contact on the Lower Columbia River”. You can view a poster and abstract for the event here. Incidentally, he has an old-school web page with tons of his extensive and highly influential publications available for download. The talk is at 11.30 in ANSO 134. I teach on Thursdays over here, or else I’d schlepp over there. 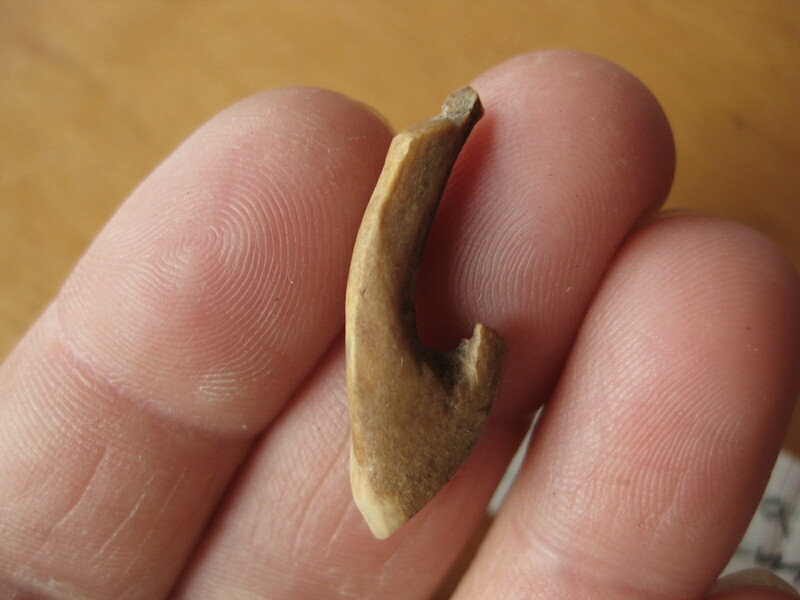 This entry was posted in Archaeology, First Nations, Haida Gwaii, Northwest Coast, Oregon and tagged ASBC, Haida Gwaii, Ken Ames, Kilgii Gwaay, ubc. Bookmark the permalink. Wish I could be there. Too bad I’m not in Victoria. Give me a call the next time you’re up! Hi Drew, hope all is well with you. Or maybe we can at least add “southern” before Haida Gwaii. Perhaps the north is becoming less poorly known? I too would love to hear more about this! Sorry i cant make it to Vic for your talk. Please keep me posted on the early celts. Earlier than the ones from Blue Jackets Creek? It’s a little hard to disentangle the data from Blue Jackets. Superficially, going on the photocopied images in Severs 1974 Plate 6 (CAA Bulletin), say, they are similar in shape and general appearance. But figuring out the relationship between Blue Jackets celts and the absolute dates from that site is not something I have nailed down yet. One of the pieces is close to a date of 4330 14cBP. The others are on a higher marine terrace and should be older, but we are waiting for dates so can’t say much, but I would definitely not expect them to be older than about 5500 14cBP, let’s say. I’d really like you to look at the raw material sometime – even just to eyeball it – they are different one to another but include a sort of creamy white siltstone like material as well as very pale seafoam green and some coarser material as well. You have a name and description of the Rupert celt material which I don’t have at hand but it resonated with what we have here. Definitely not typical examples of, in my view, that central coast “greenstone” which you say is chlorite, right? I would love to take a closer look at them sometime – NIR or eyeball technique. Indeed the central coast celts (greenstone ones) are made of a chlorite rock. A good number from the North Coast and adjacent Northern Interior are made of a rock called smaradigite (a type ‘amphibolite’). All of Gary C’s celts from MchNicol Creek were made of this. To me, they looked like a very dark green chert – it has a chonchoidal fracture. Your pics didn’t really jump out to me as something i recognized immediately.